We hope you had a restful Thanksgiving break. Now is the final push to the end of the semester! Don't forget that we will have a TDPS Town Hall Meeting today 11/28 at 12:30-1:30pm in the Choreography Studio (room 1611). This gathering provides an opportunity to reflect on the semester, to ask questions, and to share experiences that may inform each other as to ways we can grow together as individuals in a School that aims for the highest bar of understanding the human condition in order to reflect it in our teaching, performances, and scholarship. 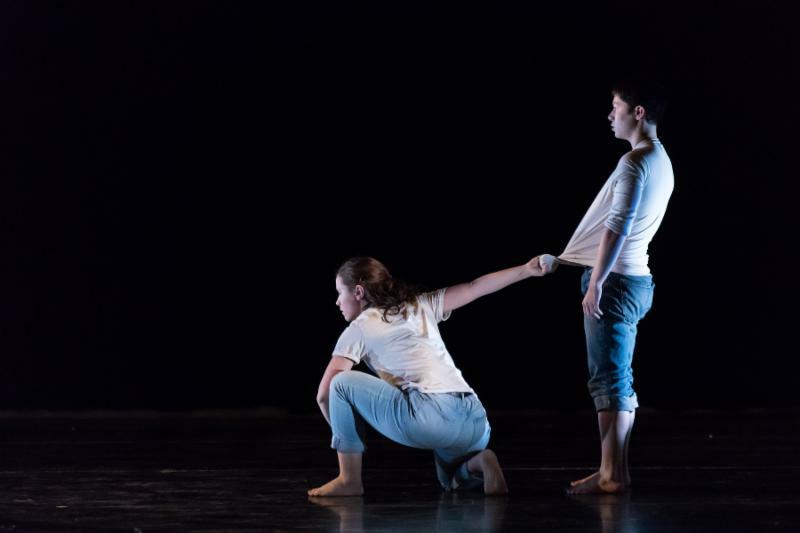 MFA Dance candidates Sarah Beth Oppenheim and Chris Law present their thesis concerts. An evening of original plays by TDPS undergraduate students Shuping Yang (Goldfish), and Whitney Geohagan and April Monu (B.W.A.). December 3 & 4: Professor Leslie Felbain's THET324 Character Development class will perform at the Smithsonian's National Portrait Gallery. They have spent the semester researching and developing a character from the gallery, and each student will perform a monologue next to their portrait as the class leads the audience on a gallery tour. Performances will be at 12pm and 2pm on each day. December 5: Have a great new play or production concept that just needs to be seen? Attend a Second Season workshop in Mullitz Rehearsal Room from 5-6pm to discuss your idea. For more, check out the Second Season proposal form and guidelines. December 7: Join the Kreators of the Kreativity Diversity Troupe for their end-of-semester performance. More information available here. December 8: Professor Scot Reese's Play Directing I class present their final scene showcase. Performance details available here. December 12: UTAS will host its annual Cabaret and Date Auction at 7:30pm in the Cafritz Foundation Theatre. This year the performance has a vaudeville theme. Interested in performing? Be sure to fill out the act proposal form. 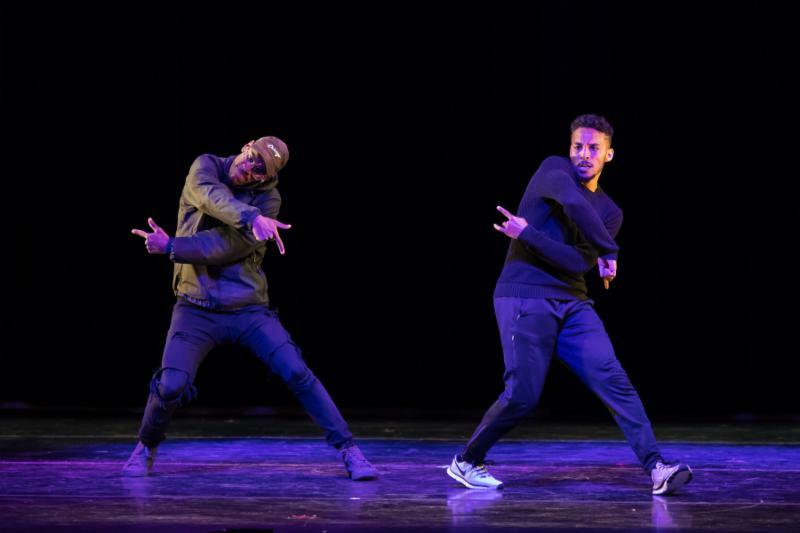 On November 13, TDPS BA and MFA Dance students and faculty performed "On the Move!," a program of original choreography, on the Kennedy Center's Millennium Stage. You can watch the whole performance on the Kennedy Center website. Check out some select photos of the performance below. Congratulations to all involved! Essence of Normal: Choreographed and performed by TDPS Dance faculty Adriane Fang and Christopher Morgan. Just Out of Reach: Choreographed by Alvin Mayes (faculty). 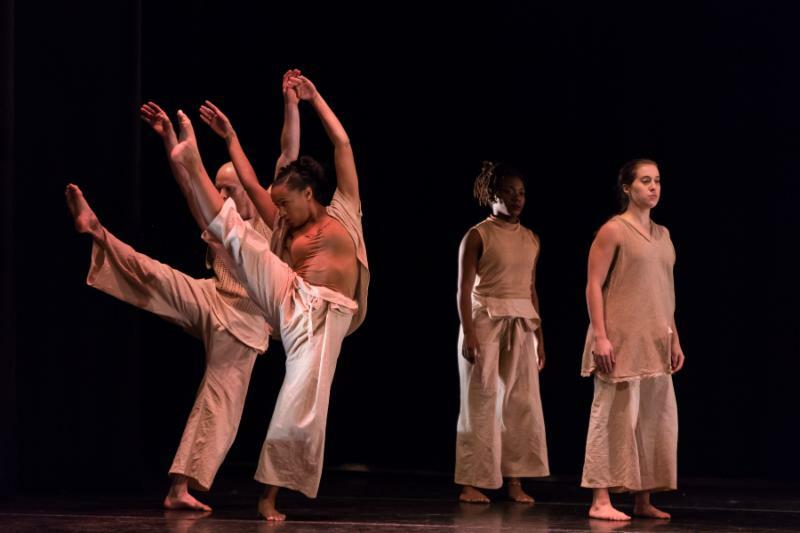 Performed by Jasmine Watkins (BA Dance ‘17), Shawn Stone (MFA Dance candidate), Laurie Dodge (BA Dance ‘19), Gabriella Di Giuseppe (BA Dance ‘17), and Sanya Oluwafemi (BA Dance student). Frequency : Choreographed and performed by Matt Reeves and Colette Krogol (MFA Dance candidates). In the Closet: Choreographed and performed by Allen Xing (MFA Dance candidate). Full Circle: Bridging the Gap: Choreographed by Chris Law (MFA Dance candidate). Performed by BA and MFA Dance students and guest artists. 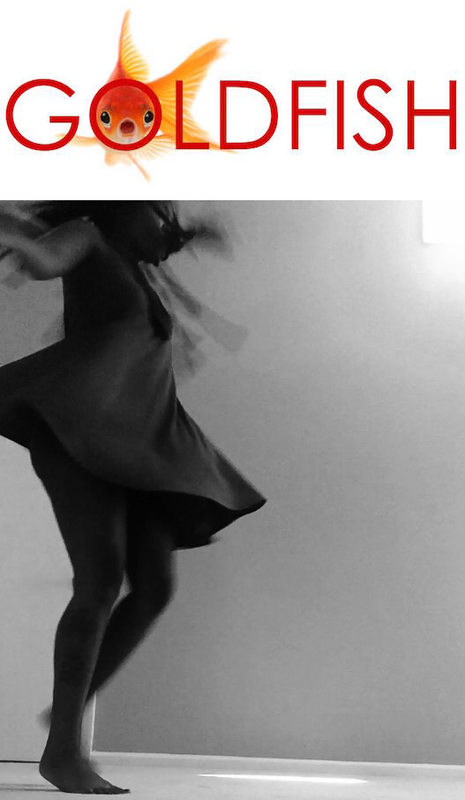 Poem of Change: Choreographed by Mustapha Braimah (MFA Dance candidate). 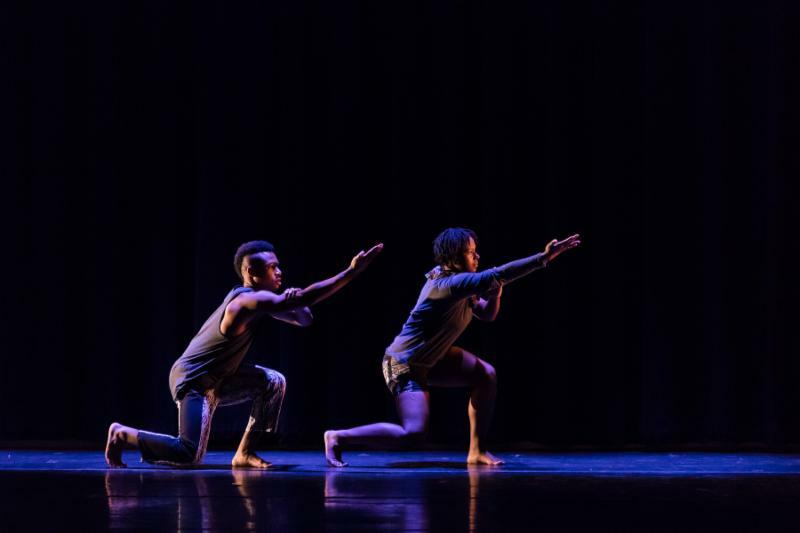 Performed by Ira Hill (BA Dance student), Jasmine Watkins (BA Dance '17), and Sisi Reid (BA Theatre '15). Null: Choreographed and performed by Christina O’Brien (BA Dance ‘17) and John Paul Ouyang (BS Biology '16). 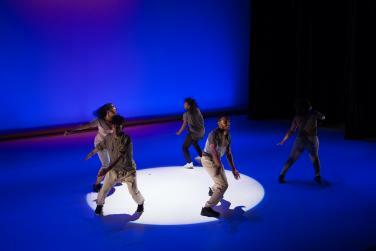 Hyperbolic (excerpt): Choreographed by Monstah Black (guest artist). Performed by BA and MFA Dance students. Where Words Once Were at the Kennedy Center. Photo credit: Yassine El Mansouri. Congratulations to TDPS faculty Jennifer Barclay who has joined Group Three of the Playwrights' Arena program at Arena Stage in Washington! TDPS undergraduate students Molly Boyle, Evangelina Hakes, Nicole Lust, Trayonna Hutchins, Gabrielle DiGiuseppe, Maria Viera, and Moyenda Kulemeka were awarded Dean's Scholars Awards this year. Read more about these outstanding students and the recent award ceremony here. 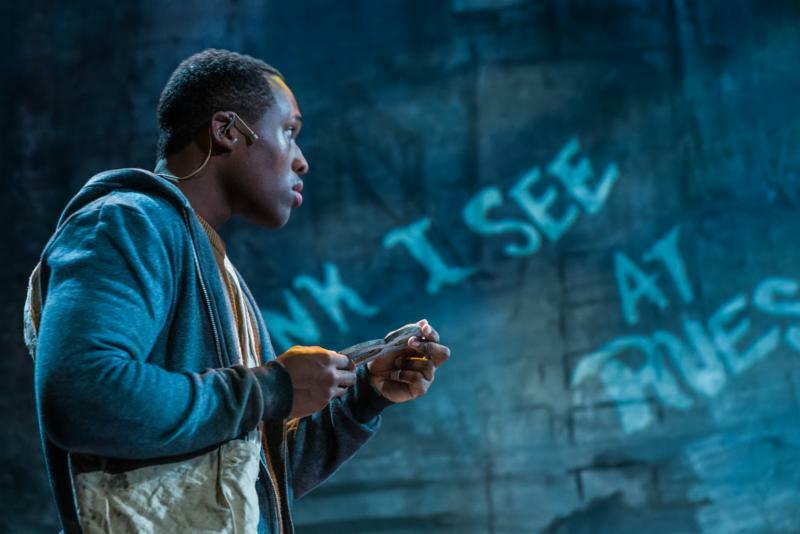 TDPS alumni Chris Lane (actor; BS Marketing '15), Andrew Cohen (set design; MFA Design '14), Patti Kalil (properties artisan; BA Theatre '10), and Maribeth Chaprnka (stage manager; BA Theatre '05) were involved in the Kennedy Center's recent production Where Words Once Were. Read more about the production in The Washington Post. TDPS faculty were mentioned in UMD's Between the Columns publication for the November 2016 edition: Jennifer Barclay for her Smith Prize; Esther Kim Lee was elected as vice president for publications and James Harding was elected to the executive committee for the American Society for Theatre Research (ASTR); and the publication of Cary Gillett’s book The Production Manager's Toolkit. Joe's Movement Emporium is seeking a public relations intern. 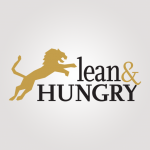 For more information, please check out their website. Registration for Staff/Tech/Design ends March 1. For more information, check out their flyer. Prince George's Little Theatre needs a replacement stage manager for The Tin Woman. Rehearsal and performances are January 3 through 28. If interested, please e-mail rpeterson@avtekstaffing.com. 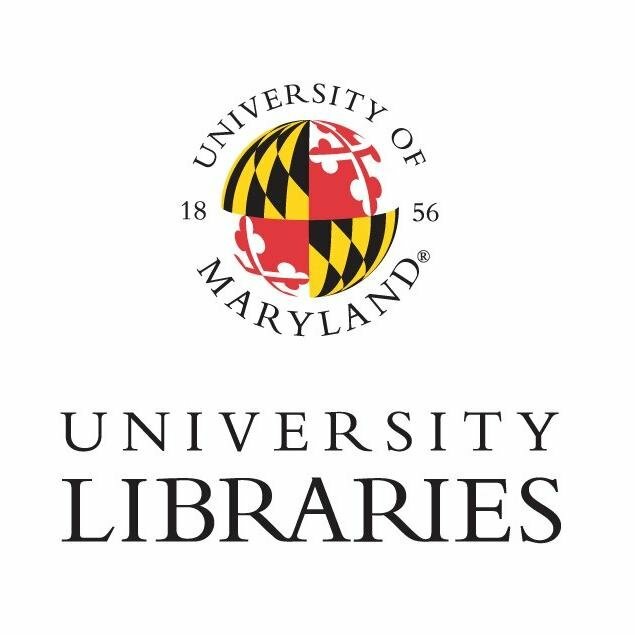 Undergraduate students: UMD Libraries are now accepting submissions for the Library Award for Undergraduate Research. As you are working on your research papers now, please consider submitting your final outstanding paper for one of the three $1,000 awards offered this year. More details available here.